The classic SNES game will join the Wii U's Virtual Console service on May 30th. The 3DS has been getting a lot of Mega Man love lately. In addition to releasing a snazzy limited edition protective case to commemorate the series' quarter century of existence, Capcom has been steadily re-releasing the first six Mega Man games to the 3DS's Virtual Console section on the eShop. Mega Man 5 became available for purchase a little over a week ago and now, Nintendo has revealed that even more retro Mega Man is on the way, this time for the Wii U.
Mega Man X will soon be joining the Wii U's Virtual Console. 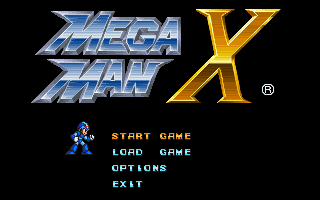 A spin-off of the main Mega Man series, it was originally released in 1993 and followed the exploits of the titular X, a robot on mission to stop the evil Mavericks and their leader Sigma. It would launch a long-running series of games that would see releases on the SNES, PlayStation, Sega Saturn, PlayStation 2, GameCube and PC. Many of the entries within the X series would go on to sell well and earn critical acclaim, making the May 30th release of the Wii U port something to look forward to. The addition of Mega Man X is certainly a boon to the Wii U's Virtual Console service, which is set to see other high profile releases in the future, including the well-loved RPG Earthbound. In the least, it will give Mega Man devotees and fans of the X series something new (or old depending on how you look at it) to do on the Wii U. Even so, with Wii U sales still moving forward at the pace of a robot snail (I'm sure there's robot snails in Mega Man somewhere), one has to wonder if perhaps Mega Man X might have been more successful on the 3DS. Although for that to happen Nintendo would need to start releasing SNES games to the 3DS Virtual Console, which it hasn't been doing for some strange reason.